Do you miss the Digg Bury Button? Be honest. 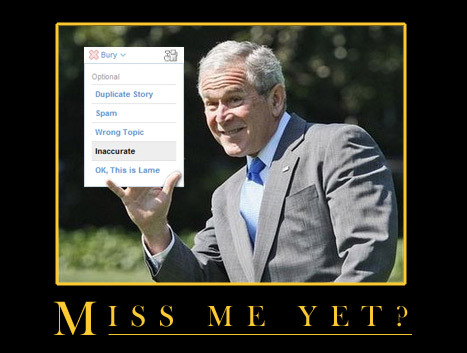 Do you miss George Bush as president? Remember this billboard? I’m missing both the old Digg and George Bush. I miss that grand time when websites were “useful,” and politicians could be trusted to make tough decisions instead of pandering to unions and other interest groups during times difficult for all Americans. I’m missing a lot of things lately. I’m missing the old Digg. Heck, I’m missing Herbert Hoover given the depth of this recession. I miss a lot lately as well. I actually miss Bush. at least he could get something done. The old digg was great, the old president not so great!